I thought Id update on my Clarisonic seeing as I've said nothing about it since my initial thoughts post about it a few months ago. I have actually stopped regularly using the device as it was breaking me out way too much. Although I felt my skin was fresher, smoother and my overall skin tone did improve over the course of the four weeks I tried it. However I was breaking out like crazy, getting spots in places I never used to get them and overall I just wasn't happy with the experiance. I don't actually have bad skin very often, I get the odd spot or two on my chin but never to the extreme the Clarisonic was doing. Alot of people say they purging phase of a Clarisonic is the worst, but they say it improves within two or so weeks. By the fourth week my skin was still terrible and I just couldn't cope. I had to restrain myself from throwing it straight into the bathroom bin! 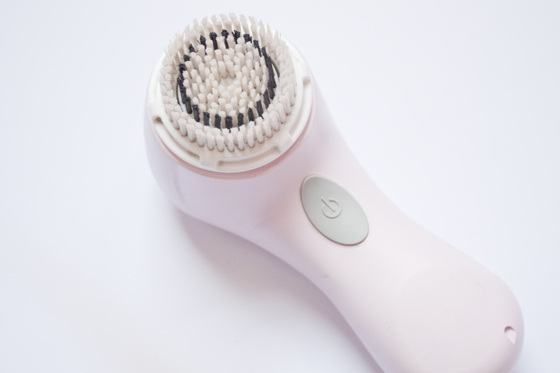 I have to admit I've not completely stopped using the Clarisonic, I have been using it occasionally to get a complete "deep cleanse" and exfoliation of the skin but I highly doubt I'd go back to using it regularly. It's way too harsh for my sensitive skin. I think this is the reason why I couldn't get on with it, the exfoliation was just way too harsh for my skin which was making it worse. I wouldn't let my review alone put you off getting one if you were thinking about it potentially investing in a Clarisonic. Im gonna put this out there but I don't personally thing bloggers "lie" about Clairsonics, I've probably seen more people rave about it than say it didn't work for them. I just didn't get on with it personally. Skincare is SO subjective, there are so many things that work for some people but don't for me, The Clarisonic included! I know so many people who have had amazing experiences with the Clarisonic Mia and I am genuinely a bit sad it didn't work out for me. I wish I was able to use it more as I did like the way it made my skin tone and overall appearance of my skin was better. I agree that skincare is a personal thing and just because it doesn't work for you doesn't mean it wont work for others its whether others are willing to invest the money to try for themselves. I am sorry that you had a bad experience but in all honesty although it has worked for me (I have oily/combo skin not sensitive at all) I can see why it might perhaps not work for those with highly sensitive skin. Personally, it's never been something I've considered trying! "If it's not broke, don't fix it" type thing, maybe it works better for people with skin problems as opposed to those using it to cleanse. If that makes sense! I ♥ the Clarisonic. I'm glad you wrote such an honest review. it looks amazing with good reviews! Thanks for the update. I've been swithering about whether or not to invest in a Clarisonic for a few months now but I have really sensitive skin and worry that it'll be too harsh. I know different things work for different people, but it's good to hear a review from someone who has sensitive skin themselves. It's so refreshing to read a review that you know is completely honest. Sometimes if so many other people have recommended something it can feel a bit odd saying the opposite. I'm glad I didn't buy one - my skin is sensitive too and my current skincare routine is just fine. If it ain't broke don't fix it!